It’s officially Selection Sunday, and even though there are just a few hours until the full field of 68 is announced for real, there’s still plenty that’s up in the air. All of that built up to this, the final bracket prediction of the 2019 season. Before we break down the predicted field, let’s take a look at the bracket itself. (Tap or click here to open the bracket in a new window or tab). 16 (Iona/NC Central) Prairie View Gardner-Webb (FDU/N. Dakota St.
4 Kansas Virginia Tech Purdue Kansas St. The Tar Heels couldn’t complete the three-peat against Duke, falling to the Blue Devils 74-73 in the ACC tournament semifinals, but few teams finished out the season as hot as North Carolina. In the final 17 games, UNC lost just twice — 69-61 against Virginia, and by one point to Duke in a game that could have gone either way. In the process, they picked up six wins against ranked teams, including three in the top 10. 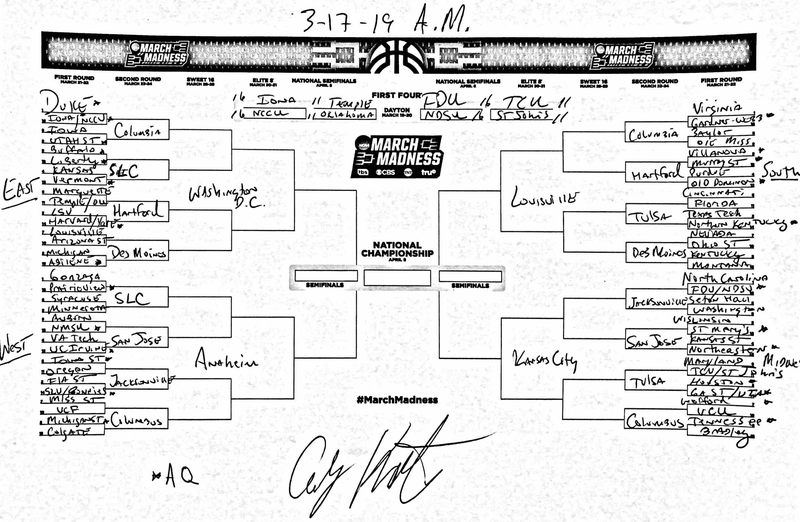 That performance didn’t go unnoticed by Katz, who bumped North Carolina up to the top line of his bracket prediction for the first time all season. If it’s any consolation to Tar Heel fans, the three years UNC has won a national championship under Roy Williams, the Tar Heels have lost in the ACC tournament semifinals. Joining UNC as a 1 seed are Duke, Virginia, and Gonzaga. The Blue Devils beat Florida State for the ACC crown, while Virginia and Gonzaga each finished the year with just three losses. The Pirates lost the Big East championship in heartbreaking fashion, missing a last-second potential game-winner to fall to Villanova 74-72. But what a performance by Seton Hall to finish the regular season. In a span of five games, the Pirates knocked off Georgetown, Marquette twice, beat Villanova once, and were inches from pulling it off a second time. That stretch gave Katz good reason to bump Seton Hall from a 10 to an 8 seed. What’s more, few players in the country have been as hot as Myles Powell, who is averaging 27.6 points over the last seven games. The junior guard scored 30 or more eight times this season, and fewer than 15 just three times. That type of star can take a team far in the tournament. What a way to bounce back for Iowa State. The Cyclones closed the regular season by losing five of their final six games, including the last three in a row. And then they beat Baylor, Kansas State, and Kansas in three straight days to take the Big 12 tournament title. Iowa State now has multiple wins over both Kansas and Kansas State, and split games with Texas Tech. That’s a pretty strong resume, and was enough for Katz to move them from an 8 to a 6 seed in his final prediction. VCU was looking as hot as ever coming into the A-10 tournament. The Rams were in first place in the conference, 25-6 on the year, and had just won 12 straight. Then, they lost 75-70 in the A-10 quarterfinals to eight-seeded Rhode Island, which finished the year 18-15. To be fair, VCU played most of the game without star guard Marcus Evans, who was injured in the first half. But that alone doesn’t excuse the loss, which prompted Katz to drop the Rams from a 7 to a 10 seed. UCF had about as strong of a final stretch as it could hope for, knocking off No. 8 Houston on the road, then beating No. 20 Cincinnati before losing a close one at Temple. The Knights finished the season as the four-seed in the AAC, earning a first-round bye. And then they got demolished by Memphis, 79-55. Not a good look heading into Selection Sunday. As a result, Katz moved UCF from an 8 seed to a 10.